This modern well appointed apartment has recently been constructed and built to a very high standard. It is located in a small, peaceful and attractive development of only 18 apartments with just 2 on each level. It is just 5 minutes away from a blue flag beach and the numerous golf courses in this prestigious resort. The bus stop is a few minutes walk away and you get a bus directly to the beach and water park car hire is therefore not necessary. It is a 10 minute stroll into the town centre to the supermarkets and all the usual tourist amenities including a huge weekly market. The numerous restaurants offer excellent cuisine at superb prices, you certainly get value for money in this resort. There is corner shop next door to the complex which has deliveries of fresh bread every day, and there is a children's playground and park around the corner. The master bedroom has its own terrace with views over the complex gardens and the large terrace has steps straight down to the pool. New for 2016 is the £1bn Rixos leisure resort. Billed as the turkey Disney resort, it has created a water park which is better in many ways than the Florida equivalents. There's free entry to the evening entertainment, and during the day the water park is a massive amount of fun, from the lazy river ride to the water knuckle rides. It's a great place to go, online tickets offer discounts and we can't wait to go back. Take a look at the land of legends theme park for more information. Why Choose The Turkish Riviera? : The Antalya region is one of Turkey's Mediterranean secrets and is fantastic value for money compared to many other European countries. It's wonderful culture and diverse variety of activities means it has something to suit everyone. Belek is on the doorstep of stunning historical sights like the Aspendos theatre and ruins at Perge. People are comparing the coastline to Spain & Portugal 20 years ago before it was heavily developed. The town of Belek is a purpose built beach and golf resort only 20 minutes from the airport. It is starting to rival The Algarve for the numbers of golfing tourists who visit annually. This area has been designated as hugely important to Turkey's long term tourism strategy. Therefore, a substantial investment in improving facilities has created a first class holiday destination with high standards to rival other Mediterranean EU countries. You will not get better value for your money. What does Belek have to offer? 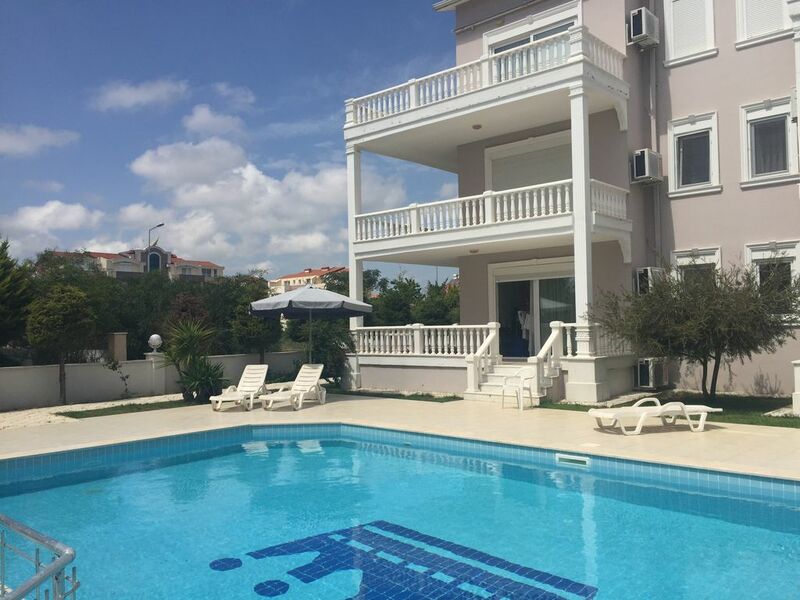 : Just 20 minutes from the airport this modern purpose built beach and golf resort is ideally located close to all the regions tourist attractions. The town nestles between the beach and the amazing golf courses with lush pine & Eucalyptus forests. In the centre of town the impressive mosque stands alongside statues and waterfalls leading to extensive shopping in the tree lined boulevards. You must not miss the local markets which sell wonderful fresh produce and aromatic spices. The wonderful Turkish & International cuisine in the town's restaurants are such excellent value for money. A short drive from the town spectacular waterfalls and riverside restaurants are a pleasurable shady treat from the hot dry summers. What are the Beaches LIke? : Cleverly designed the brand new beach park facilities combine fun at the beach, exquiste white sand and all the usual water sports. The sunbed and shade hire are cheap and plentiful. There are shady parks and children's play areas with picnic areas for a great day out. The traditional ice cream sellers produce wonderful treats. Beach side restaurants and bars offer a stylish and relaxing atmosphere with sumptuous sofas and hammocks so you can enjoy the sea breeze while soaking up the Mediterranean sunshine. Standards of cleanliness are high with plenty of brand new, shower toilet and changing facilities and car parking right next to the beach. Hi, I am Peter and the proud owner to this apartment. My two children and I love visiting turkey for a great family holiday at least once a year. We feel that, its value for money we make the most of the beach, which is lovely and spending time in the pool are just a few of the things we love to do. Having the Pool outside the door, it's just like having your own villa with a private pool. There is rarely more than one family using the pool - which is normally mine !! The corner shop has amazingly good value food and snacks and the owners are more than accommodating. Wifi is available and the town a short walk away. There is a large modern corner shower cubicle with power shower, basin and toilet in the fully tiled bathroom. The lovely ceramic tiled terrace area has marble steps to provide direct access straight down to the pool area from the living room. The master bedroom also has its own terrace which overlooks the gardens at the rear. The high specification of this apartment includes secure intercom access, on- site security, and electric shutters and net curtains on the windows. The bright and airy open plan living area features modern furniture with a large L-shaped sofa in cream faux suede, a flat screen TV and DVD player and a very stylish kitchen. There is a dishwasher, washing machine and family sized fridge freezer and microwave. In the dining area there is a table with 4 chairs and a further patio table on the terrace which seats 6.The apartment has a washing machine, clothes horse, iron and ironing board. Air conditioning and heating in all rooms. Four of us arrived in Antalya airport around 12 am. From there we hired a car and it took half an hour to arrive to the apartment. The instruction given by Claire is really useful!. The security guard is really nice and helpful. The apartment is really cosy for four of us. My 1 year old daughter was really enjoy living in the apartment. We don't have any complaint about the apartment. We had an enjoyable stay in this well found apartment. It has almost everything that one would want whilst on holiday. Just a couple of very small things though. The Hot Water cylinder has a tendency to leak through the safety valve and one must keep the bucket underneath to avoid a pool of water on the floor. The shower drain is clogged and doesn't drain well. I did mention it to the Kings maintenance man but not sure if he understood me well enough. Other than that the apartment was excellent. I would suggest that you take a good stock of Dvd's and reading material as the telly channels are almost non existent and the instructions for everything are in Turkish. That includes all of the whiteware too. The area around the apartments are still being developed and there are large pools of water close by with heaps of frogs and aquatic life. The kids loved it. The swimming pool was a saviour after a hot day out and the resident local kids readily made friends with our lot. One should consider hiring a car as it isn't easy to get around using local transport and the local cabs charges vary a lot. We found Star Rentals to be excellent value. Modern cars and unlimited mileage. Petrol is a bit dear, almost 3 lira per litre. Be prepared to get hassled a bit as you walk around Belek and other towns by over enthusiastic shopkeepers. Don't be afraid to bargain also. Biggest market in Serek on thursday but local market in Belek of Saturday is nearly as good with excellent fruit and vegies. Local shop on corner from apartments has fresh bread every morning and nice Effes beer. Take your empties back for a refund too. Remember that a large majority of the population are Muslim and be prepared for the early morning call to prayers which are loudspeakered around the town three to four times a day. You get used to them and everyone else just carries on with their business as usual. ATM's are quite plentiful in most places and Money exchangers too. Eating out try different places every time to get a feel for the local food or you can play safe and just eat western style food. Always ask for menus with Lira prices as you tend to get overcharged for Euro's or other currencies. It was still a bit quiet and early in the season when we where there and not too hot but we did have a lovely time and it's not overcrowded and the roads weren't very busy. The apartment is right in the middle of a new residential area but don't be put off by that as the locals are be friendly. I am extremley pleased that you had an enjoyable stay. We had the water boiler serviced in April 2009 so I will check with the maintenance people to see why this problem has not been resolved. Kan varmt anbefale området og lejligheden. Vi havde en dejlig ferie i 14 dage i Belek. Dog fik vi ikke den anviste lejlighed som på billedet men en der lå øverste oppe. Det var ok, for der var mere vind og selve lejligheden var super hyggelig og skønt med aircon. Det eneste vi godt kunne ha brugt var en markise til udover altanen, ellers var alt i finest orden. Go service med taxa og de var så søde og kontakte os inden vi skulle hjem om vi havde brug for kørsel retur til lufthavnen. I’d like to thank you for accepting an alternative apartment which I offered when mine became unavailable. As an owner you have to make tough calls and I never like to let any of my clients down. I worked hard to rent another larger apartment for you at my own cost, to cause no disruption to your holiday and I’m pleased that it worked out perfectly for everyone.